My backpacking venues have included a combination of Minnesota hikes where I have lived most of my adult life, and Arizona trails where I moved to take a new job about four years ago. I have always been a "comfort-weight" backpacker, never counting grams, but still keeping my pack as light as easily attained. 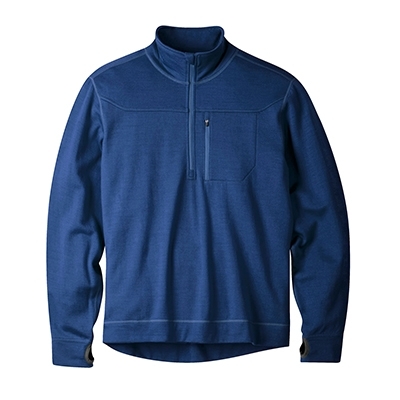 I normally carry a fleece jacket into the backcountry in the cool seasons, but I am keen to try out a wool garment to keep the "funk" to a minimum. My measurements confirmed the dimensions of the zipper, collar and cuffs. The zipper length seems generous to me, which I find attractive as it allows easy on/off and good ventilation when desired. The garment appears to be made with high quality - I could find no sewing defects, loose threads, etc. I was surprised that the hang tag was attached with a safety pin embedded in a seam, and I may have damaged the seam removing it. I put the garment on over a T-shirt and checked for fit in a mirror. I was relieved that it fit perfectly; I have a very long torso (23 in or 58 cm) and typically need to purchase Large-Tall sizes for shirts and jackets, but since a Tall size was not available I went for the Extra Large. It was not baggy nor loose fitting - their label of "Athletic Fit" appears to be accurate. The length was good in the torso and the sleeves - I could even use the thumb loops without feeling I was stretching out the sleeves. It'll be interesting to see how well this wool garment retains its size through several launderings. The photo at left shows the Rendezvous slipped on over a cotton T-shirt. It is a bit more fitted than the photo would suggest, because the picture was snapped from a low vantage point which distorts the perspective. It was a bit warm to be wearing a wool garment the day the photo was taken, but I still felt an immediate warmth when I put it on - this should keep me pretty toasty. On the other hand, the fabric is not particularly thick nor by any means windproof - I'm thinking a windshirt or the like to stop a breeze will be a good item to accompany it. It also felt somewhat scratchy. This will not be a problem for me, as I certainly intend to wear at least a T-shirt under it at all times, but it did not seem as smooth as some merino garments I have touched in the past. I put the Rendezvous on as soon as I hit my campsite, as the temperature was falling fast. I wore it over a silk long underwear top and a merino wool T-shirt, and put my windshirt on over that. I was plenty warm while doing camp chores (temperature around 40 F, or 4 C), but when I sat down to eat dinner I chilled quickly and had to throw my sleeping bag over the top of me to stay warm. I wore the Rendezvous all night long in the same configuration, as I was using a sleeping bag that was rated for a temperature a bit above the ambient conditions. The next day I took off the silk top before I started hiking and then doffed the windshirt once I started to warm up, so I was wearing the Rendezvous over my merino T-shirt at a temperature of about 38 F (3 C). This kept me at a near perfect temperature while hiking: not chilled, and not perspiring. Overall it was a very successful first outing with the garment. The morning was chilly enough that I kept the Rendezvous on during the duration of the hike. I started to perspire just a bit when I was doing some climbing in the sun, but not enough for me to want to take the warm shirt off. For most of the hike the breeze was brisk enough that it kept me dry and at a perfect temperature. It isn't often I discover a new trail close to my house, but this one turned up on a local hiker's blog. I set out on a crisp Sunday morning to do a little exploring. It was right at the freezing point, so I began the hike with a windshirt over the Rendezvous. Within about 15 minutes of climbing I warmed to the point where I could take off the windshirt and hike with just the Rendezvous over a thin baselayer. As soon as the sun peeked over the tops of the mountains I quickly stowed the Rendezvous in my pack where is stayed for the remainder of the hike. I am finding that this combo of Rendezvous + windshirt is very effective and adaptable. I had never hiked the Sycamore Canyon section of the Arizona National Scenic Trail, and I was looking for a trail with not too much elevation gain/loss for a change, so I set out on a Saturday afternoon for an overnight hike. I had the Rendezvous on at the beginning of the hike, as it was chilly when I began, but removed it after about 30 minutes once I warmed up. It went back on immediately when I reached my campsite, as the temperature was dropping fast, and a down vest went over the top of it. This is a great combo: down vest over the Rendezvous, as the merino wool keeps my arms warm, and my core temperature was maintained by the vest. I slept that night with the Rendezvous on. I like the way it keeps my throat warm at night, as I have a tendency to get sore throats in the cold weather. The next morning I wore the Rendezvous for about the first 30 minutes again, then stuffed it into my pack, right after I snapped the photo above. I seem to be finding a pattern: wear the garment for 30 minutes at the start of hiking to warm up, remove, then put back on immediately when I stop. I purchased a new hammock that I wanted to try out, so I headed out for a quick overnight to my favorite camping spot in the Catalina Mountains. 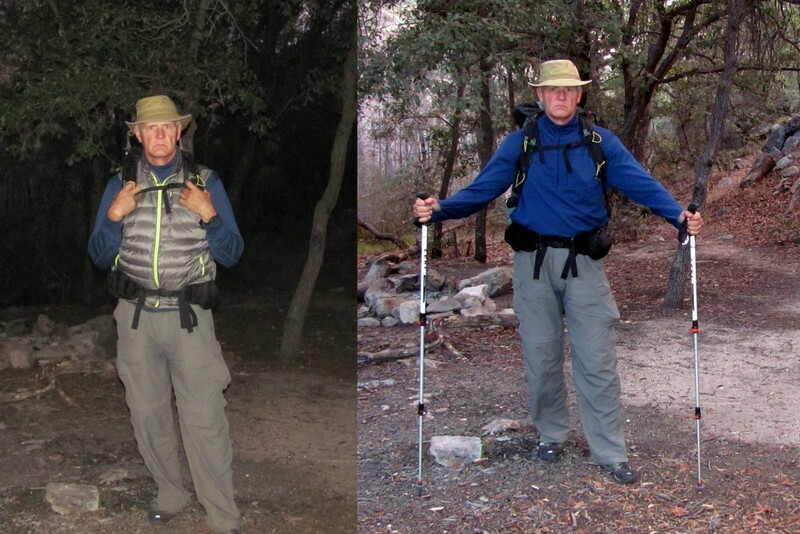 I put on the Rendezvous as soon as I hit camp as it was cooling down rapidly, then soon added a down vest for warmth. I noticed when I tried to use the thumb loops that the sleeves were a bit constricted, as if they could have been a little longer. The next morning I set off before the sun came up wearing both garments, as the temperature was right about freezing, then took off the vest after the first mile as shown in the following photos. The Rendezvous stayed on for about the next hour until the temperatures warmed up to where I could hike in my shirtsleeves. I am finding I really like hiking in the Rendezvous in cold weather - it keeps me warm, vents well when the zipper is opened, and breathes nicely if I heat up a bit going up a slope. One of the things I noticed when I got home after this trip is the garment was pretty wrinkled from being stuffed into my pack, and the wrinkles did not really want to come out. I threw it in the wash for the first time, and it came out beautiful, wrinkle-free and looking brand-new. 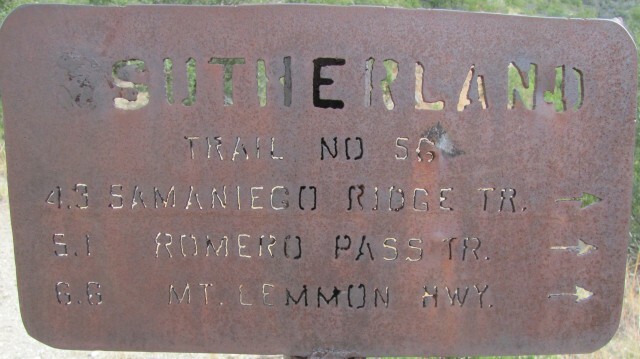 I have done several short sections of this trail as a day hike, but it ascends all the way to the summit of Mt Lemmon and I had never spent the night along the trail so I thought I'd see how far up I could go. The trail starts out with a gentle climb in the foothills, then turns into a rugged Jeep trail, finally transitioning to a brutally rough climb straight up the mountainside. It was too warm to wear the Rendezvous hiking the first day, but as usual it went on as soon as I hit camp at 4:30pm and stayed on all night. In my hammock at night I noticed small sparks of static electricity wherever the merino wool rubbed against my hammock as I moved; wool + plastic = static. The sparks were not big enough that I could feel them, though I could feel my hair stand up a bit. I set off back to the trailhead early next morning in the dark, and the Rendezvous kept me at the optimal hiking temperature with ambient air at 40 F (4 C). After about an hour of hiking the sun started to peak over the mountains, the air began to warm and I stopped for second breakfast and a break (see photo at left). Right after the picture was taken I doffed the wool shirt and hiked in shirtsleeves back to the trailhead. Overall, the Rendezvous shirt has been a nice garment to have with me in the backcountry. I have enjoyed its wooly warmth. The Grandview Loop is a "lollipop" hike: it begins by descending to Horseshoe Mesa from the Grandview Trailhead, loops to the left down to Cottonwood Creek, then connects to the Tonto Trail to circle the backside of the mesa, hooking back up with a connector trail back up to the top of the mesa at Hance Creek, then back up to the trailhead. This was only my second foray into the Canyon, and though off the beaten path it requires only modest mileage and altitude for a three day hike and has water available at convenient distances. The conditions were a bit challenging: fresh snow covered the trail on my descent, and over the course of the next two days it thawed and was trampled down enough to turn to slick ice on the way up out of the Canyon. Temperatures were cool, but I had prepared for worse than I got. The Rendezvous served me well on this trip. The following picture was taken in camp on the second night out. Shortly after the photo was taken the temperature began to drop as the sun set and I had to add another layer. I wore the Rendezvous as my main warmth layer while hiking on all three days. On the second day it warmed up a bit and the sun came out, so I had to stash it in my pack most of the afternoon, but other than that it got a lot of use. It breathes very nicely so it can be worn over a reasonably wide temperature range by zipping and unzipping the collar. I appreciated the zippered chest pocket to store my reading glasses while hiking, as I need to pull them out to read maps, GPS, camera settings, etc. Despite being worn pretty steadily for three days it smelled reasonably fresh on my return, though I did launder it when the hike was over. It continues to wash up cleanly. I wore the Rendezvous on numerous cool evenings in the last few months, mostly to sit out on the deck when socializing. It is a very attractive garment, one that I have no qualms about wearing in any kind of social situation. It is perfect for keeping me toasty when the temperatures are around 55-65 F (13-18 C) and I am sitting outdoors. The Rendezvous has been a great piece of gear that I have thoroughly enjoyed using over the last four months, as it is both highly functional and attractive. On my Grand Canyon trip I appreciated its flexibility when used as a layer beneath a vest or outer shell. I intend to continue to use it in situations where I am willing to carry a bit heavier garment (versus a down sweater, etc.) and want to enjoy its cozy warmth. Thanks to Mountain Khakis and Backpackgeartest.org for the opportunity to contribute to this test.